Welcome to the premier issue of The Homeschool Seeker. I hope you enjoy the newsletter as well as the mini lapbook. This month's feature topic is basic math. I only have one major update on the website that is coming this month to report. I will be taking down the used books for sale section as I feel it really isn't helping anyone. Instead I will be replacing that with reviews of websites that sell either new or used products that will be helpful for homeschoolers. There will be a form to make suggestions for either products or websites that you might want reviewed. 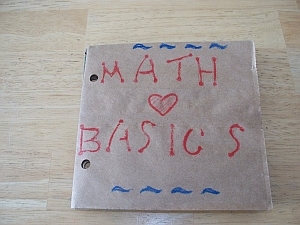 This month's feature mini lapbook is on Basic Math. Here's how I created this mini lapbook. 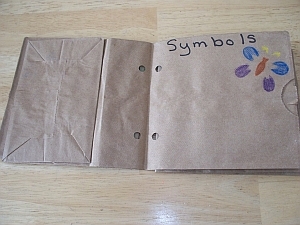 Math book or SparkCharts. I have the SparkCharts and they are a handy reference and highlight the important facts. Of course, a basic math book at your child's level will also work but it will take a little longer perhaps to gather the information. If you are interested in the SparkCharts you can get them at bookstores or here is a link to Amazon.com. 2. 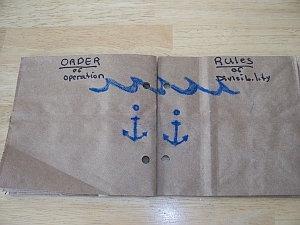 Once you have all your supplies, fold the 3 paper bags in 1/2 and hole punch the edges. 3. Begin by decorating cover. I would recommend at least labeling it with "Math Basics"
Depending on your child's age and ability determine if they need to practice just one set of facts or perhaps on 2 digit or 3 digit subtraction/addition. Add a couple of examples of each. 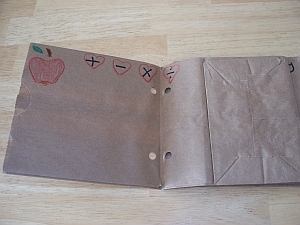 If you do a set of facts consider using a flap up page to make a testing flap up. On the top of the flap write the practice equation. Underneath the flap write in the answer. My suggestion here would be to do a couple of examples on a practice sheet and then give your child a 3 digit number and have them factor it out. If correct they get to put it in the book as an example and decorate the page. One idea to demonstrate symmetry would be to have your child find symmetrical images in magazines and cut and paste them into the lapbook or they could also draw some funny but symmetrical images. Let them be creative. I devoted 2 pages to symbols for my daughter because I wanted her to really understand that certain terms correlate with certain mathematical operations. So I had her make a flap test of the symbols. The second symbol page I had her devote to the symbols of inequality... greater than, less than, etc. For this page I had her copy the order and decorate the page. My main focus here is that she learn the order. By reviewing this lapbook often and applying it in her lessons I am confident this will not be a problem. Again these rules are extremely useful when your child gets into higher levels of math...so introduce the rules, have them write and illustrate the rules to begin with and then review often. 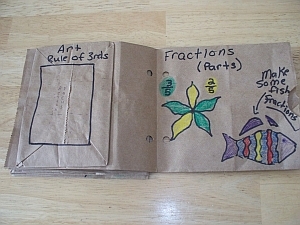 As you can see from the list a whole mini lapbook could be devoted to fractions. In my example picture I drew a fish as an example of how someone with younger children can start to introduce fractions. I tried to make it like a little game. How many yellow stripes does the fish have? How many total stripes? Part of the whole concept. On the second example page, I wanted to show how one could start applying math concepts to other subjects. In this case, the study of art and composition. The final page I devoted to preschoolers. I made a collage of pictures composed of simple shapes using stencils. 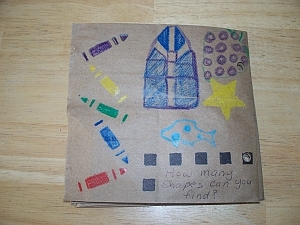 With a young child I would then sit down and ask them to count the different types of shapes. The idea is to adapt the information to the level of your child. A Math Basic book for a preschooler would be much more basic than a book for an eight year old child. Again, I suggest using your child's regular math book to get an idea of some topics. Pick topics that were or are difficult for your child or that you feel are important for them to review. This would be a great end of the semester/book/year project. During the break, if they just reviewed the main concepts once a day, the material from the previous book would be more likely retained. Decorate the mini lapbook with art crafts and supplies. Assemble by sewing or attaching the bags together. Math Tip of the Month: Use a timer. Make it fun. Play math games. For basic math practice one game is to pick a favorite 1 digit number, for example 8. Then anytime you see a bigger number have your child try to figure out a way to come up with 8. 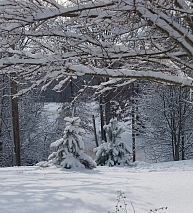 This picture is a tribute to our snow school day. We transformed a field with images. 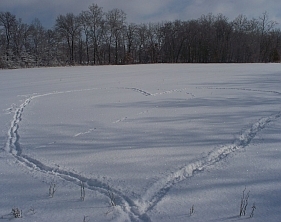 This is mine...I love snow and I love snow days. If you would like to send a picture to be considered for use in The Homeschool Seeker there are several places on the website where you can submit the image. Just please add title HOMESCHOOL SEEKER PICTURE so that I know it is not a Kid's creation submission. Thanks. Question: How do I keep my children focused on their math problems. They get easily distracted and if I walk away for even a few seconds I come back to find them staring out the window. Answer:Actually there are several things you can try to help your child focus. I like to use a timer. Set the timer for just a little bit less than how fast you want them to finish 5 problems. For example I want my son to finish 5 problems in 6 minutes. So I set the timer for 5 minutes. Now, make a game or challenge your child to beat the timer. Do they understand how to do the problems? Also, make sure they understand the problem or how to do the problem. It may be that your child is stuck and rather than ask for help...daydreams or fiddles. If you discover this is the problem, take a deep breath and explain the steps again on how to solve the problem. Have them then work through similar types of problems until you are confident they know how to do the steps. Then go back to the original problem and watch only as they work out the problem. Let them figure it out. If you find that you are prompting them -start over with explaining the steps by using an alternative method. Try doing the problem in a more hands-on or visual manner. Is the material too easy? Careful observation of your child as he/she does Math can help determine how you should try to get them to focus. One of my children I discovered has severe allergies. This can also be an attributing factor but this problem can be treated. Another one of my children is easily distracted by well...just about everything. The timer method works best for her but it works better if she is racing me. I usually have to knit a row or something in the same amount of time she is working on her problems. I hope you enjoyed this issue of The Homeschool Seeker. Until next time, happy homeschooling!